Keeping your home cool keeps your family comfortable. Whether you’re looking for a new air conditioner or just need a checkup, CJS Heating & Air is ready to help. We understand how rising temperatures can wear your patience thin. Your comfort should never be at risk. That’s why CJS air conditioning technicians are available to you 24 hours a day, everyday, with no overtime fees ever. Call CJS: (937) 488-4758. Air Conditioning maintenance is critical to keep your system running efficiently. A small problem caught early not only prevents expensive repairs later, but also prolongs your system’s life. 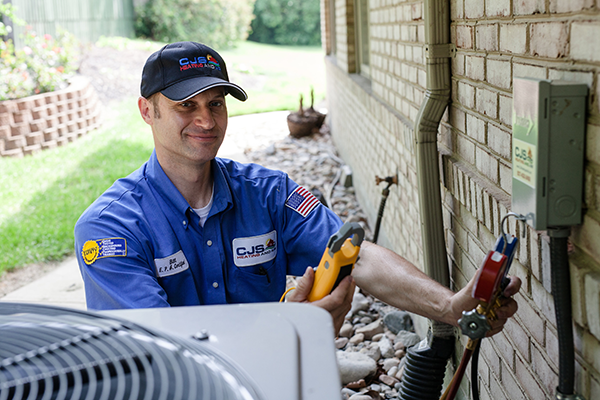 Schedule your CJS Precision AC Tune-Up. Call CJS: (937) 488-4758. AC repair doesn’t have to be a headache. CJS air conditioning technicians are certified to service all brands of air conditioners. We don’t just say we’ll do a good job, we put it in writing—and guarantee it. Schedule your AC service now.Call CJS: (937) 488-4758. Has time come to update your air conditioner? Schedule a FREE CJS System Review. Call CJS: (937) 488-4758. A CJS System Replacement Specialist will help you choose the right system for your home’s specific needs. We’ll work with you to keep your home cool, energy efficient, and more comfortable.